Black bicycle. Phil Wood High-Flange Rear Hub Laced to Red Deep-V Rim. Front Low-flange Phil Wood Hub laced to textured gray deep-v. Unique brooks 'cambium' saddle. USPS Eagle Stamp on headtube. 36mm Nito Bars. MKS Touring Pedals with Leather Straps. Black carbon track fork. Top tube has several dents. Bars have a large 'door' ding in them. Bike is drilled and has braze-ons for rear brake (special SFO edition). On October 22 2013 the victim wrote: In the evening of October 21, 2013, after over a week of diligent review of all craigslist ads and all ads posted to Facebook group called "Chicago Bike Sellers," I came across a Facebook posting with a picture of a complete bike. Mounted to that bike were my handlebars and stem! Some additional searching revealed that many friends of the seller were students at a certain Northwest Side high school. The next morning, I headed out to that high school to take a look at the bikes parked outside. I immediately noticed my bike locked to a fence, everything (almost) intact, except that the bike had a different set of handlebars and different stem. 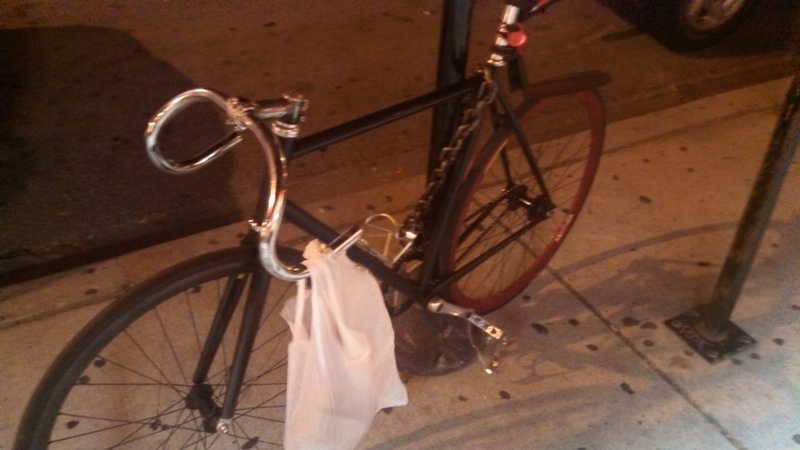 First, I made arrangements further lock the bike up (2 chains and a U-lock). I then went inside the school and contacted the administration who immediately involved the school's assigned CPD officers in the matter. I explained the story of how I came to find my bike so far from where it was stolen, and provided certain additional details (including my police report number). I left the school, waiting for word on the bike. After a few hours, in the early afternoon, the CPD officers phoned me to let me know that I should come back and unlock the bike so that they could take it over to the police station to inventory it before releasing it to me. When I arrived back at the school I was pleased to see that the one lock that wasn't mine had already been removed. The police loaded the bike up into their van and asked that I come to the station after school was out to pick up the bike. I made sure at that time to mention that the handlebars and stem were still missing but that the Facebook ad containing them was being actively updated. After arriving at the police station I waited about 30 minutes, at which time the CPD officers from the school arrived and released my bike to me. They also suggested I wait around for a few more minutes, as the student who had listed my handlebars and stem for sale was on his way over with my handlebars and stem. Sure enough, he arrived and I ended up making a full recovery of my bike (except for saddle bag)! I was very encouraged reading the other recovery stories on the Chicago Stolen Bike Registry website and urge anyone reading this to be persistent in trying to recover their bicycle. Spotting one tiny part (the stem) attached to a different bike in a blurry photo eventually led to my recovery success story. I am thankful for those recovery stories on CBSR (which kept me motivated to keep on looking) as well as the efforts made by the staff at CPS, CPD and Upgrade Cycle Works to help me make the recovery happen.